Sorry, I'm going to need to run it again, this time using a larger lattice with absorbing boundary layers. And figure out how to organize the image files. Putting them all in one big folder doesn't work as you can see. However, this data could be considered to represent the frustum operating in a very small perfect metal box. Energy leaks out through the antenna co-ax connection and bounces all over the place. (kind of like EW testing at ambient with the chamber door closed, only smaller.) I need to absorb the energy before it bounces off the edges of the lattice in order to represent an open test facility. Of course in the real world, your cavity will have other gaps, even if very small, but aren't you planning an open air test? As for data organization, what do you suggest? I have made cuts across the x axis at the big end and small end, and center cuts across the y and z axis for each of 14 time slices and 6 EM field components. I'm inclined to think that 24 folders would be best, each folder containing 14 time slices of one of 6 EM field components for one of the 4 cuts. These are the same cuts that I make for Dr. Rodal's use, and upload in a single file, but of course csv files are not very visual. I was afraid of the RF mess that putting the antenna through a hole and not sealing it off would cause and I dislike the asymmetrical mishmash of modes half generated. I think it would be wise to wait until we can get a square loop antenna to put in instead of eating up your computer time. Thanks for the work, it it as always greatly appreciated. I laid in bed thinking about the confused jumble of images until I realized at 3AM they were not jumbles they were run different this time. 8 meep time slices if the different views of the frustum. If you browser displays only 5 across or any number other than 8 it's hard to see the patterns. I re-sized my browser to display a row of 8 and the sequences appeared in nice columns. Looks better, but still a lot of artifacts from leakage I suspect. The various mode generations looks interesting, I see 4 at least. Thanks Aero it was more the way the images were change in the layouts that caught me off guard. i know this is getting off topic, but I Love that theory by Edward Kipreos.. it's so neat. not that i understand it beyond a vague level of comprehension. it's never sat right with me the universe's expansion should be accellerating.. it just seems disturbing on some level .. and he's only modifying things slightly..
That's your problem, right there. TT (or any other comments welcome), since you posted your idea of a TE preconditioning idea here is mine I've been thinking of for a few days but haven't had time to flesh it out but you can get the idea. You were quite happy to lecture a poster on here about doing further research. So I'll turn that around and suggest if you want to know the people with alternatives to dark matter theory that you do some research on the matter. It's not my job to justify your statements for you. There are an increasing number of scientists who are having doubts about the whole concept of Dark Matter/Energy. But I figured I'd ask to see if you could rustle up the source you got that from, or if you just made it up on the spot. Such sources are easy to find should you have the mind to look. Here's one relating to Dark Matter. C'mon. That wasn't an answer to my question and you know it. I know alternative explanations are out there. You can just read the wikipedia page for a brief introduction, simple as that. Citing alternative theories doesn't justify that statement. You need to show a source that demonstrates more and more scientists are abandoning dark matter and energy for alternative theories, not just that alternative theories exist, which is self evident. For conservation of E & M folks, Dark Matter disappearing from theory is like saying Newton was a fraud, imo. The balancing force to gravity is labeled dark matter to explain the imbalance of forces. I might suggest that a belief in dark matter is no more controversial than a belief in propellantless forces. Both involve unseen "magic". And both should be given their day in court. So I will say it Wolfy, if propellantless EM force is real, it could easily be a bridge to GUT. Perhaps thats why many are watching this very closely. It is good to challenge, not to disuade...think there's a lot more to gain that deep space exploration if it turns out to be the real thing. Yes I understand your drawing. Will think about it. Mu idea is 100% traditional microwave 101 circular waveguide TE01 mode excitation tech. When ?, what is the latest estimated date for the first experiment measuring thrust? Maybe, maybe not. Time will tell. At least I laid out the pathway from 4N/kW to 307N/kW. If Prof Yang's measured 4N/kW and Q = 1,531 for that 2010 wideband frustum is correct and the latest 2013 narrow band frustum design = Q of 117,500 and Specific Force scales with Q and Df, then 307N/kW is doable. 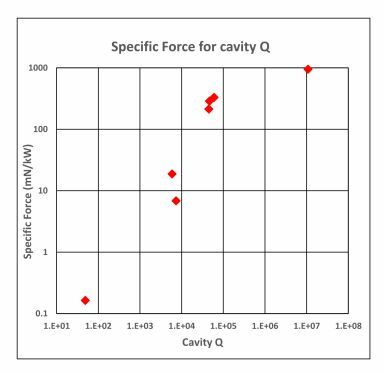 So far, based on 8 data points, Specific Force seems to scale with Q. Not plotted is the Prof Yang 4N/kW result with a Q of 1,531. Sort of blows the chart apart. Why is vacuum Energie ^120 times to big? Because of the mathematical singularities associated with Quantum Mechanics, and the inability up to now to come up with a unified theory of Quantum Gravity. So, I take the ^120 problem as a symptom of the fact that we don't yet have a satisfactory theory of Quantum Gravity. I would rather rely on the astronomical measurements pointing towards the value of the cosmological constant than relying on Quantum Mechanics calculations for the vacuum energy. I would not rely on Quantum Mechanics calculations of the vacuum energy until we have a theory of Quantum Gravity. We were able to explain inflation without a theory of Quantum Gravity. It is deceptive to use the efficiency parameter (N/kW) when you see on Yang's graph's that when you increase power you end up with a way lower efficiency (720mN/2.5kW). What this shows that the thermal impact has a far bigger impact then you assume and that with an increased Q you're massing up gigantic power intensities in the resonance patterns. I'm not sure how that follows. Maybe you meant dark energy there, because it is "repulsive" while familiar mass-energy is attractive? Dark matter behaves just like regular matter gravitationally. What imbalance of forces are you referring to specifically here? There is no imbalance of forces in gravity from a Newton's 3rd law perspective. Yes it is basic 101. What this shows that the thermal impact has a far bigger impact then you assume and that with and increased Q you're massing up gigantic power intensities in the resonance patterns. Just adding on to this, does anyone have any idea (@rfmqguy in particular) what the highest Q ever obtained by an electromagnetic resonator (whether a cavity or circuit) is? Ie. in the actual physical world, what is the best Q ever obtained? Prof Yangs data showed the cavity input bandwidth was much narrower than the magnetron output bandwidth. Without spectrum matching each measurement point, as they did for the corrected dip data, there is no way to know how much of the magnetron's energy actually ended up inside the cavity. Look at the attached 6 examples to see now narrow is the cavity input bandwidth (lower left box in each of the 6 graphs) versus the massively wider magnetron output bandwidth. I'm sure Prof Yang does know the true power that was inside the cavity at each measurement point (as she did in the 6 examples) but decided to use the total magnetron output for the graphs. She is thus reporting much lower Force per input power than the real values. Probably not wanting anybody to get excited about 4N/kW values at a Q of 1,531.